It’s almost Easter. That means it’s hunting season at local grocery stores for those sweet, sweet creatures called Peeps. You know that marshmallow goodness shaped vaguely like baby chickens and smothered in neon-colored sugar crystals. To check out the manufacturing process of these sweet little guys and gals, check out this Chicago Tribune slide show. Not only does MentalFloss.com give us 16 delicious facts about our favorite Easter candy, they verify what we all know: That yellow is still our favorite color Peep, but they do offer Peeps in a variety of colors. The company behind Peeps announced it will introduce a light green variety. How does lime fudge float your boat? If you are lucky enough to live by a Target that showcases this chromatic display, you should have no problem finding a color to fit your Easter theme…and taste buds, of course. You are even luckier if you live in Minnesota and frequent the Mall of America because you can visit Peeps & Company– one of three flagship stores from Peeps originator, Just Born. Other locations are located in National Harbor, Maryland, and Bethlehem, Pennsylvania. Outside of the traditional marshmallow candies, you can find apparel, office gear, scented Yankee candles, and sporting equipment. As you’ll note, Just Born is also the parent company of Hot Tamales and Mike and Ike. If one little Peep — or a 4-pack– may not cut it, curb your Peep craving by constructing this giant Peep cake from the Food Network. BaconToday.com shows us how to enjoy this sugary confection covered in chocolate…and of course, BACON! 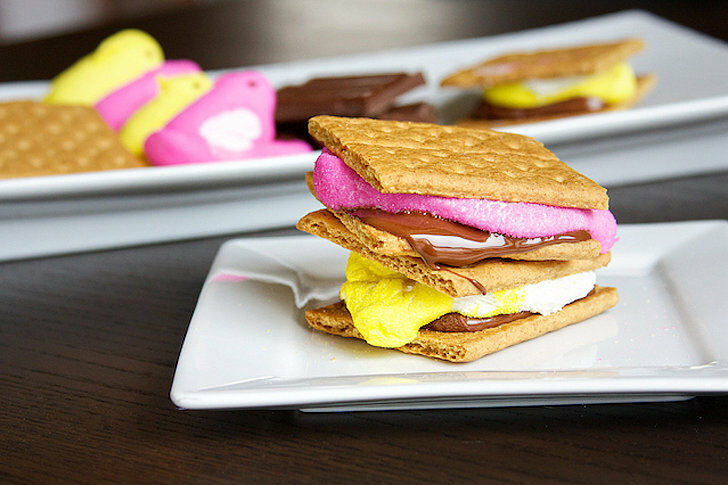 Could it be true that even Peeps are better with bacon? 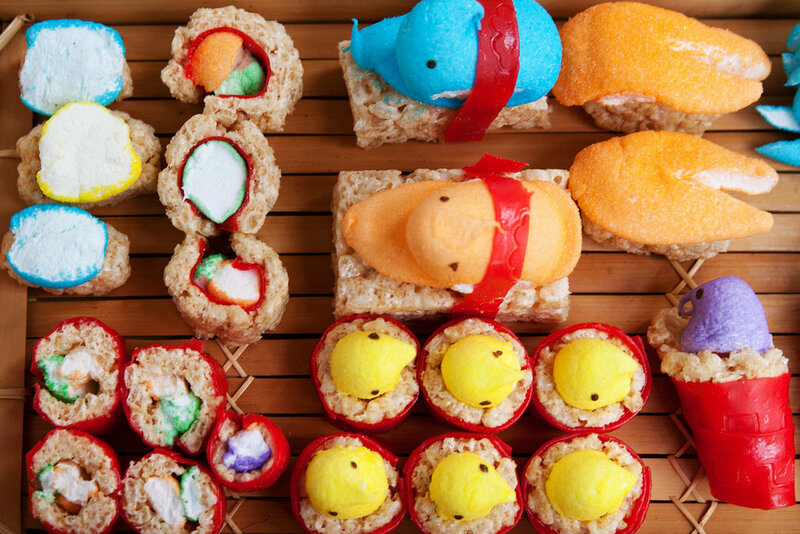 I have the same issues with Easter Peeps that I do with Thanksgiving Turkey– What do I do with the leftovers? Of course if you are competitive eater, Matt Stonie, wouldn’t have leftovers. Peep Milk does a body better than any other form of Peep. Not sure that pouring this on your Fruit Loops will taste like…perhaps trying it as flavoring in your coffee? Perhaps you would rather drink your Peeps in a “harder” form. Check out WikiHow to learn how to make Peeps Vodka. Have yet to find a Peep to fall in love with? This year, the company behind Peeps tweeted it will introduce the white Peep. These chicks are mysterious, and we know that every man loves a girl shrouded in mystery. If you aren’t into eating them as much as playing with them, you enter the Washington Post’s annual Peep diorama contest. I love the masterpiece that celebrated the anniversary of Pride and Prejudice zombie style. Artist David Ottogalli hosts the site PeepsShow.com where he showcases his own art and photography of Peep creations. His KF Peeps or “All Cooped Up” are definitely worth a closer investigation. (His images are copyrighted or I would have included an example here, but scoot on over to his website here. It’s worth a quick view for the background alone. BadCasserole.com will show you how to use Peeps to completely cover your cubicle. They not only covered the entire ceiling, they blocked out the window, covered the desk and the keyboard platform as well. Funny that their friend wasn’t necessarily a fan of the legendary Peep. Too much work? 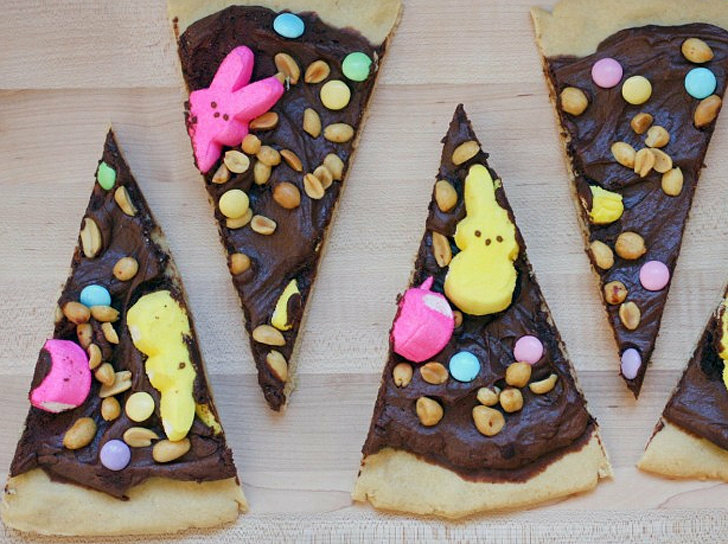 How about a Peep-themed video game…or two? At I-Mockery.com, you can play Peepsteroids or Peep Invaders computer games. Interested in learning more? PeepResearch.org houses studies on how Peeps react to cold and hot, low-pressure environments, and Quintuplet separation surgeries. Perhaps most scientifically entertaining is their 3-part study on the effects of Alcohol and Smoking on our favorite little marshmallow sinners. Seems many people are obsessed with the science of Peep torture. 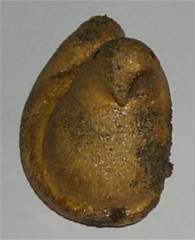 TenHolder.net will show you how to take your traditional yellow peep and turn it into poop. That’s right, poop. 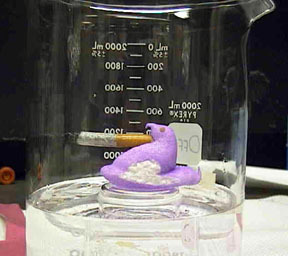 Or you can do what Chief Scientist, Carl Nelson, did and put Peeps in a vacuum chamber. And if those aren’t enough ways to torture a Peep, this blog gives you 100 ways to Kill a Peep, including by Jeep, grated, and of course, Luke Peepwalker. Millikin University took it to a new level when they did research on Peeps’ abilities’ to do research. You can check that out here. But don’t think these sweet divas want to stay in the laboratory, they have dreams of stardom as well. Filmmaker Adam Rifkin has optioned film and TV rights along with his partners for the Peeps candy. Just Born, the company pushing out Peeps all over the country, has sprung for a full-length family feature film in the style of the Lego Movie. The film will show the story of “a wayward Peep gets misplaced and must adventure through the fantasy lands of different-themed dioramas before the contest’s judging begins,” according to Deadline.com. This wouldn’t be their first foray in Hollywood though. They guest starred on South Park’s Fantastic Easter Special where they were microwaved and saved the day. They already know how to handle the paparazzi. ABC News featured pictures snapped from Peeps all over the world. Apparently, what happens in Vegas doesn’t stay there too long. Psst! Hey, you…yeah, over here. Wanna see the back room? It’s NSFW (not safe for work) but you can see Peeps pinned to female parts here. And yet, if none of this does anything for you…I mean, AT ALL, you can always join Ivan Knauer, who is probably the most vocal anti-Peep activist on Earth. 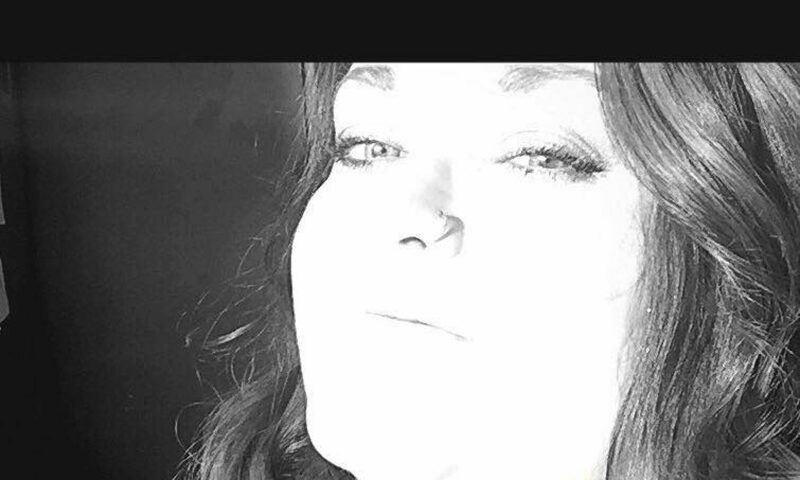 Looking for my take on?